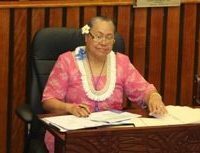 Mrs Fialupe Felila Fiaui Lutu looks set to be the new HouSe Representative for District No 5, Sua #1 which included the villages of Amaua, Alega, Avaio, Auto, Fagaitua, Laulii, Aumi and Tafananai. Mrs Lutu, the current chief Clerk of the House of Representatives had 94 ballots, or 26% of the 357 ballots cast. In an interview with KHJ News shortly after she took out a nominating petition for the Sua seat, Mrs Lutu said she had been approached by voters in their district to run and after talking with her children she decided to enter the race. She has been chief clerk of the House for more than ten years and before that she was a deputy Senate Secretary. Mrs Lutu will be the second female faipule, joining Tuala-uta Representative Vui Florence Saulo. For the rest of the 5 candidates, Tuifagalilo Vele polled 72 votes, 20% , Tuialofi Faalae Lauatuaa Tunupopo received 64 votes, 18%, Laloniu P. Maloa received 57 votes, 16%, Uele Fale S. Uele polled 50 votes, 14% and Ketesemane Meaole received 20 votes, 6%.